*This book was provided for free by the author for review. 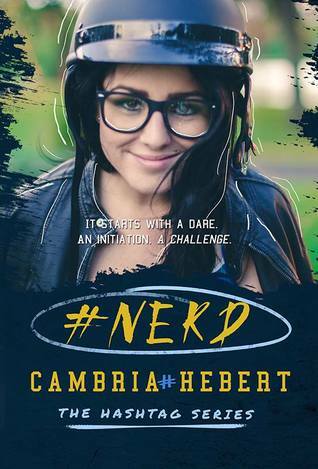 First off, I want to thank Cambria Hebert for gifting me a review copy of #Nerd. I was so excited to read this one. #Nerd was SO amazing! I absolutely loved this one! The story drew me in immediately and once I started reading, I couldn't stop. I read over half the book when I should have been sleeping. I only stopped because I knoew it would only be a few hours before my daughter would be waking up and I needed to get some rest. I just couldn't get enough though! As soon as I got the chance, I continued reading. The characters (especially Romeo) were very easy to fall in love with and the story was very realistic and very reminiscent of college life. I really liked that there were equal parts romance, emotion, and sexiness (HELLO! That library scene in the beginning!!). I loved Rimmel and her story. We all have felt like her at times and I found her very easy to relate to. We seemed to have a lot in common, her and I. And Murphy! I wish I could have Murphy. Romeo... Oh, Romeo. We all know someone like him or went to school with someone like him. The popular jock that gets all the girls, has the best luck, and no matter how much you hate to admit it, is devilishly good looking. It was nice to see his journey from player to boyfriend throughout the book, to see the other side of things. I'm really happy that his character had his own point of view chapters. Overall, I LOVED #Nerd and I absolutely cannot wait to dive into #Hater. Favorite Characters: Romeo, Rimmel, and Murphy. thank you so much for posting a review!